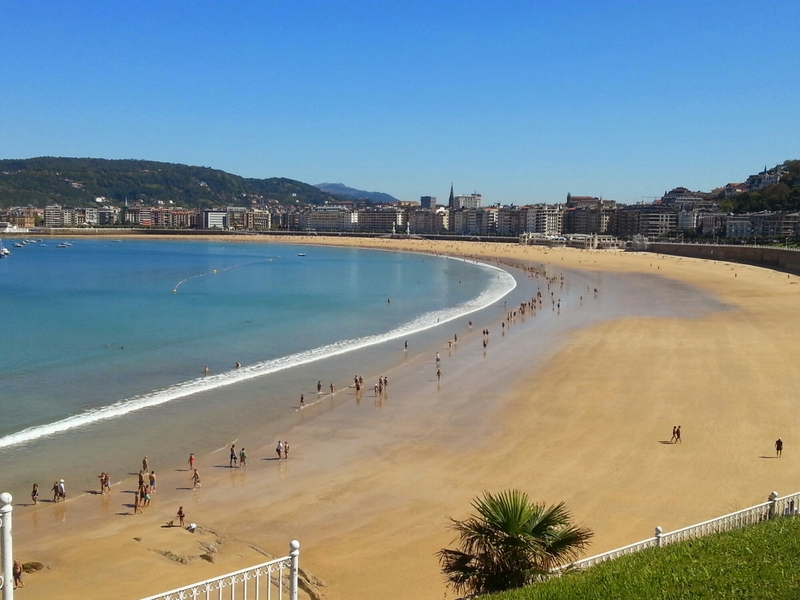 A couple of weeks back, I was in that glorious jewel in Spain’s foodie crown – Donostia San Sebastian. Not only is it the place for possibly the best bar crawl in the world where you can gorge on fantastic pintxos (See my pintxos bar hopping post) , it also has an abundance of stellar (as in Michelin star) restaurants where you can have a sit down meal rather than eating on the hoof (hence the title). 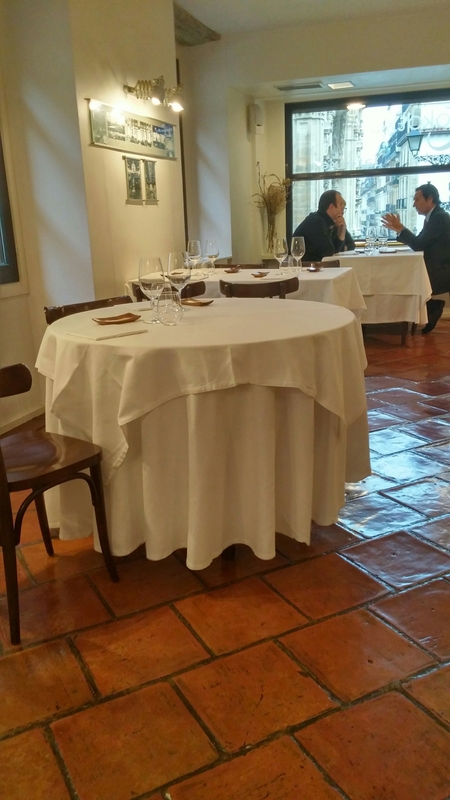 As to the stellar state of the restaurant scene in Donostia, it is a city of just over 187,000 inhabitants and has more Michelin stars (16 stars) then Cardiff, Bristol, Birmingham, Leeds , Manchester, Liverpool, Glasgow, Edinburgh, Newcastle and Nottingham have combined (15 stars). It also has more 3 star establishments (3) than London (2) (with the later having a population of well over 8 million as opposed to Donostia’s 187k). This is a place that seriously punches above it’s weight on the food front, having more stars per head of population than anywhere bar from Kyoto in Japan. Whilst tempted by the 3 star gastronomic temples that are Arzak, Akelare and Martin Berasategui if I am honest the prices of these places were a wee bit too rich for my blood on this trip, with their tasting menus ranging from €155 to an eyewatering €195 per person before wine etc and 10% tax is added. 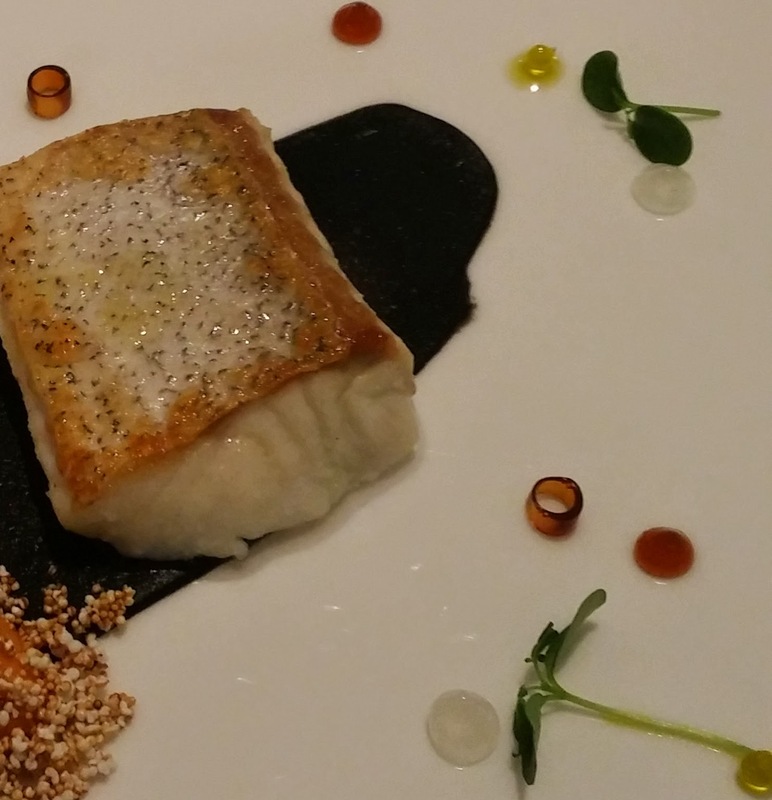 I, therefore, went for one of the 1 star establishments in the form of Restaurante Kokotxa ( kokotxa – pronounce cococha – is the Basque name for the gelatinous gland on the throat/chin/jowls of a fish usually cod or hake and a much sort after cut of fish in Pais Vasco which you see in every fishmonger and on most menus) in the Parte Vieja (old town) of Donostia. This place had the added advantage of being easily walkable from the Art 7 Apartment Mrs. SF and I stayed in. 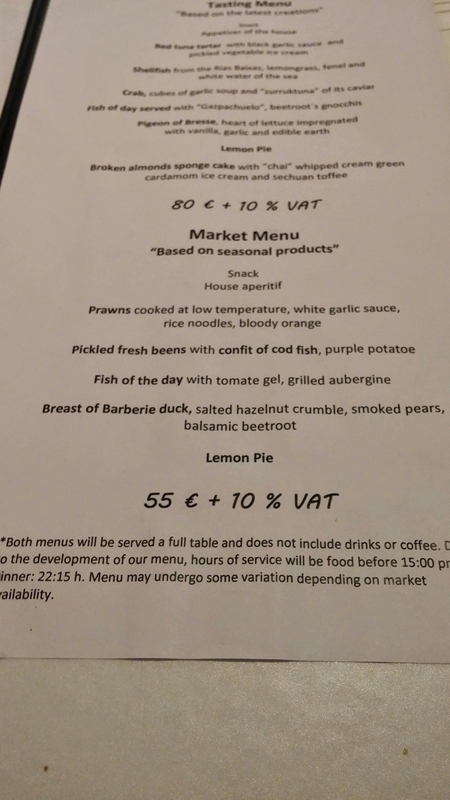 They have two tasting menu, the Market Menu – based on seasonal produce – (6 courses) at €55 plus 10% tax and the Tasting Menu – more experimental – (8 courses ) at €80 plus 10% tax. Both seem to me very reasonable especially when you factor in the current favourable Sterling:Euro exchange rate (take off roughly 25% to get the Sterling price) and the very reasonably priced wine list (more on that later). As we planned on hitting the pintxos bars in the evening we decided on the lighter of the two options in the form of the Market Menu (Mrs. SF was probably thinking “and the cheaper one, you tight git”). The focus on seasonal produce of that menu also appealed to me. The place is very unassuming on the outside (easy to walk past without noticing it) and quite austere on the inside with stone floors, white walls and white linen table cloths. I liked it, as it was very unfussy. Not a fan of fussy decor me. Whilst persusing the wine list (always a bit of a challenge with a tasting menu) we had a very nice Palo Cortado (sherry) which set the tone for a rather fine meal. First up were some beautifully crisp and light breadsticks with a mustard emulsion to dip them in. Nice subtle flavours here. 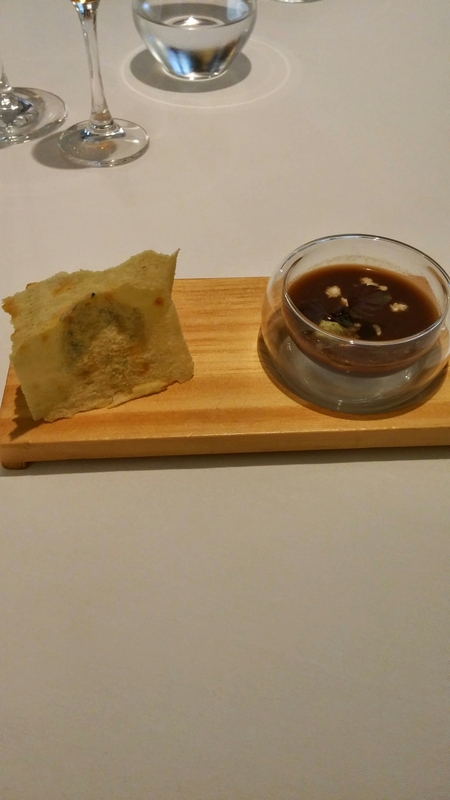 The “House appetizer”, was an intensely flavoured and coloured (almost black) onion soup to which salty feta had been added. It came with a salmon “sandwich” which was a rich smoked salmon mousse sandwiched between two wafer thin parmesan crisps. It was a really well flavoured dish (not at all overseasoned even with the added feta) and was polished off with gusto. 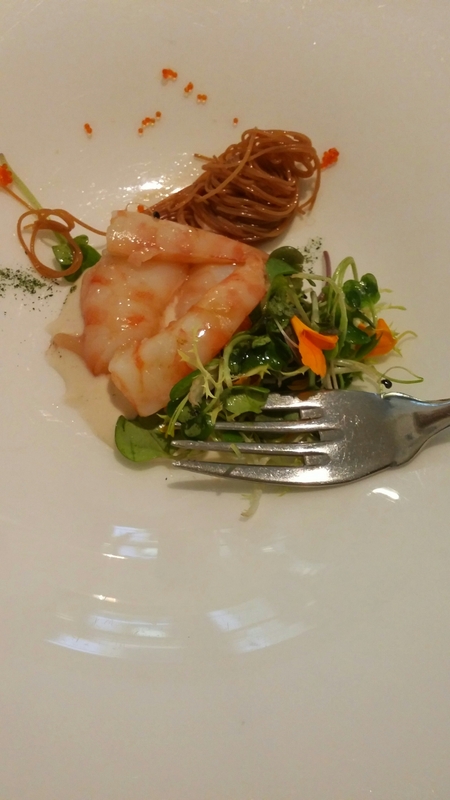 Next up was a dish of slow cooked wild caught prawns with pine nut “ajoblanco”, angel hair noodles and grapefruit. This was a beautiful dish. 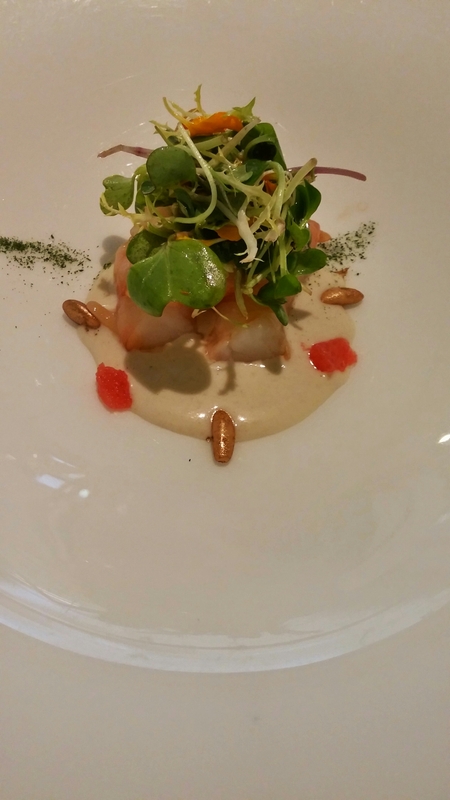 The prawns, barely cooked, were lovely and tender and packed with flavour. Nestled by them was a twirl of perfectly cooked angel hair pasta. Interestingly it was brown. I am not usually a great fan of brown pasta, but this had a lovely nuttiness to it. The ajoblanco was their take on the classic Andulucian cold almond soup but here it was an emulsion with pine nuts as the base. Add to this the citrus sharpness of the grapefruit, some intensely flavoured fish roe (flying fish I think the waiter said) and you have a great dish. The pine nuts used as a garnish were even painted gold, not sure why but they looked nice and showed a real attention to detail. I loved this dish. 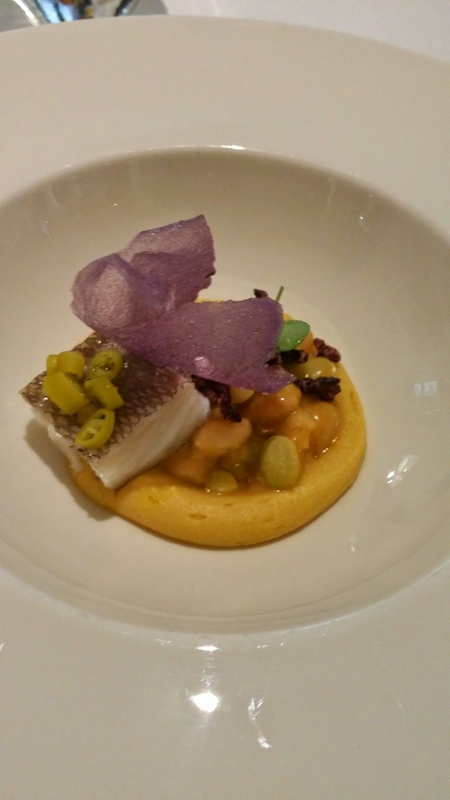 The first proper fish course was another crackerjack of a dish in the form of pickled Narvarra white beans with confit cod, purple potatoes and piparra chillies. 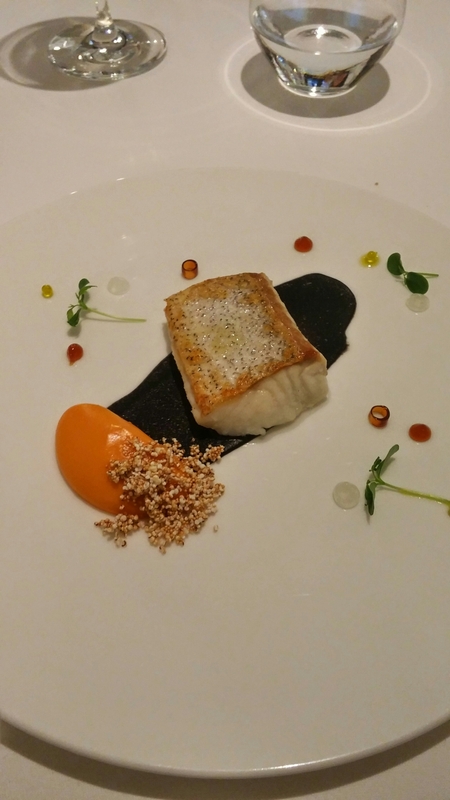 The cod was perfectly cooked being just the right side of translucent, whilst the pickled beans were both whole and in the form of a smooth as a baby’s bum puree. The chillies added a nice bit of heat to the dish. The purple potatoes came in the form of a purple crepe paper thin wafer. Pretty as a picture (and God knows how long it took to make), in reality it was purely decorative as it didn’t really add anything flavour wise. Another exemplary fish dish, hake this time, was next up. Boy can this place cook fish.This came with a rich tomato gel, a smattering of crunchy seeds and a heavy smear of chargrilled, smokey puréed aubergine across the plate. I was initially worried that the smokey aubergine would overpower the delicate (perfectly cooked) hake. No need to have worried as it complimented rather than overpowered the fish. The tomato gel was intensely flavoured but again worked as an integral part of an excellent dish, with the seeds adding a nice crunchy texture. 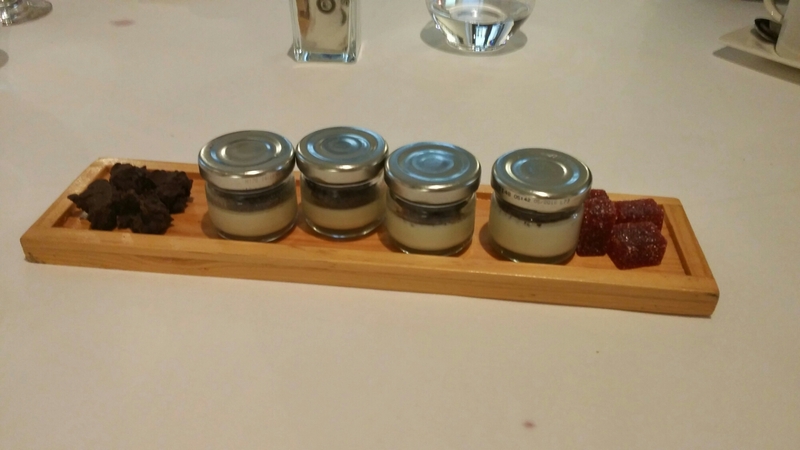 Surrounding the dish were tiny spheres and gel tubes which I initially thought were merely decoration but in fact were packed full of intense citrus, olive (the white and green spheres) and ozone/the sea (the reddy tubes and blobs) flavours. Must be hugely labour intensive producing and then putting these so beautifully on the plate, but worth it as they worked brilliantly. Really clever and intricate cooking on display here. 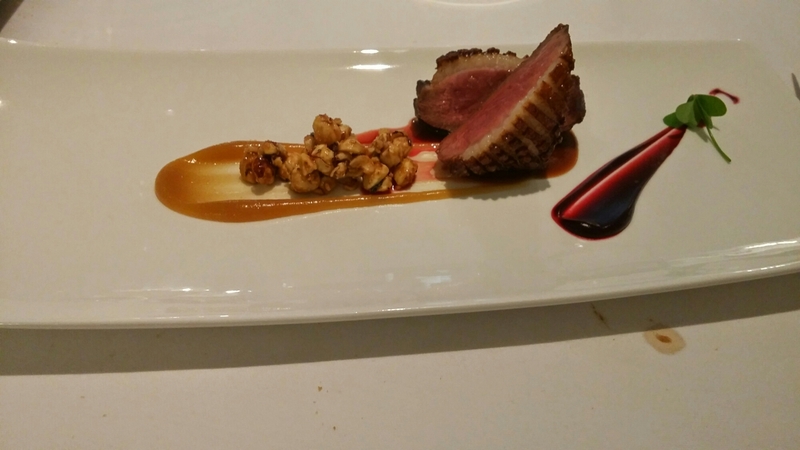 On to the meat course, which was a Barbary duck breast served with a hazelnut crumble, smoked pear and balsamic beetroot. It was recommended by our waiter that we have it medium rare but my blood thirsty nature took over and I asked for it rare. This was a mistake as, whilst the meat was tasty (if a tad on the tough side) and the skin crispy, the fat underneath had not fully rendered down. I can’t blame the kitchen for this as they had recommended it be cooked for longer. 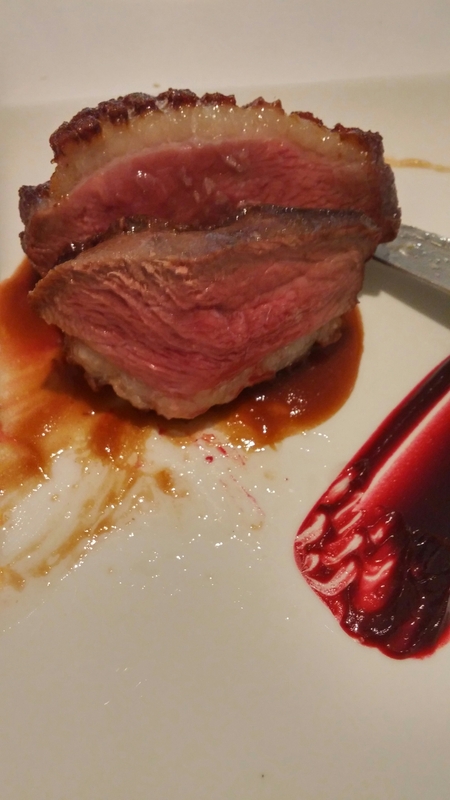 The sweet smoked pear puree and intense earthy beetroot worked really well with the duck as did the flavour and texture of the caramelised hazelnut crumble. Again a well crafted dish, even though the duck itself was slightly disappointing (my fault). Mrs. SF who had her duck cooked as the kitchen recommended had no such complaints, so more fool me. 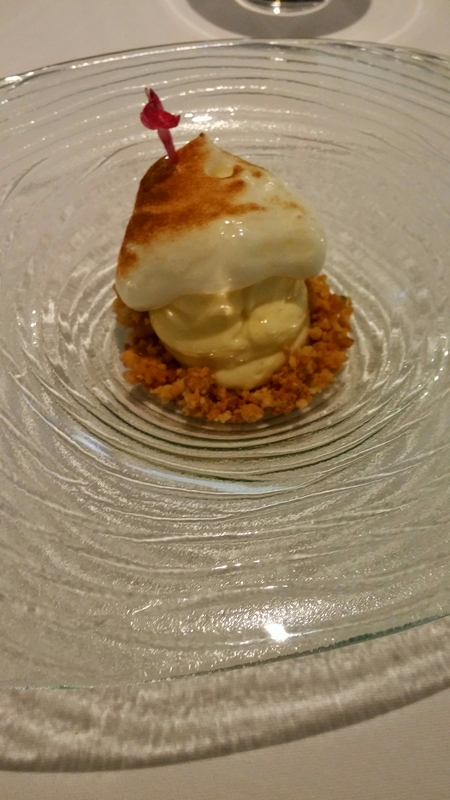 The final course was their lemon pie, which was a very superior lemon meringue pie. Light as a feather meringue (Italian meringue I think) and a beautifully sharp and refreshing lemon filling on a nice biscuit crumb. A lovely take on a down to earth classic. 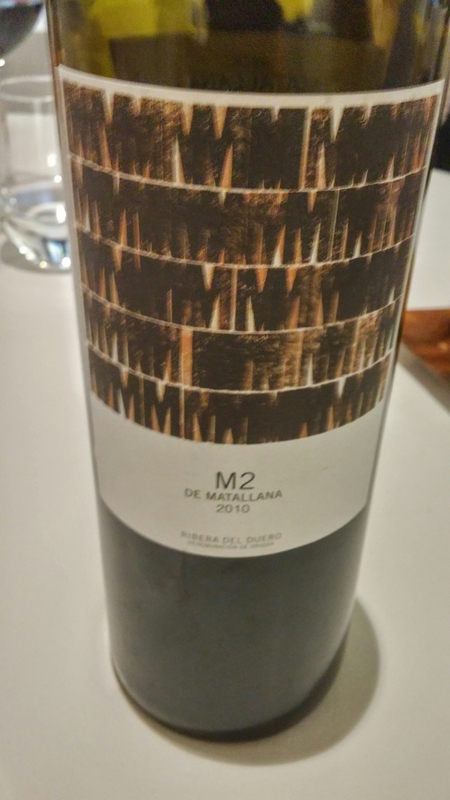 and a Ribero del Duero in the form of an M2 de Matellana from Telmo Rodriguez (€40). A beautiful wine full of dark fruit, smokeness and tobacco aromas and flavours. Perfect with the duck. Both were extraordinarily good value when compared to UK restaurant wine lists (£59 and £75 respectively were the best prices I could find them or comparable wines for on UK restaurant lists). How can a Spanish Michelin starred restaurant survive on 30% mark ups (as against retail prices in Spain) on these wines when in UK the mark ups are around 300%? I think I know why and it is because the Spaniards and Basques would simple not accept UK levels of mark up. Why do we in the UK ? We finished off proceedings with some nice coffee and petits fours. Would I go back? 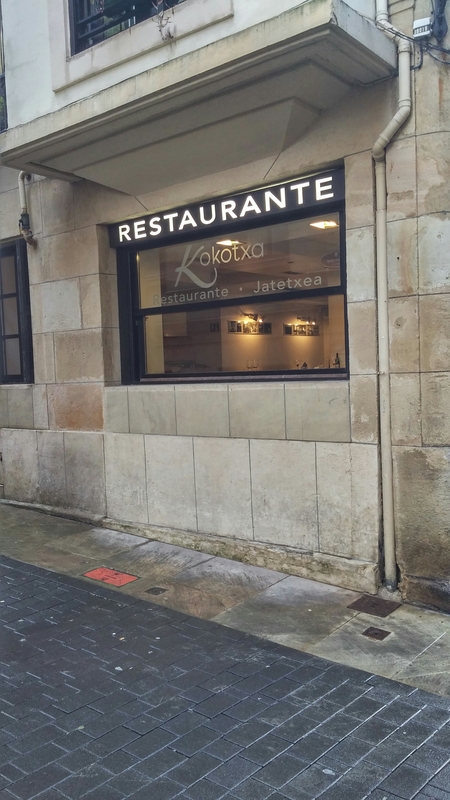 Going back next year to Donostia (Mrs SF and I now make an annual pilgrimage to Donostia) and I would heartily recommend Restaurante Kokotxa to anyone visiting there. Great food and wine and charming service. Other places I would recommend for a sit down meal when you want a break from the Pintxos bars are Bodegon Alejandro, La Muralla (both in the Old Town) and Vinoteca Bernardina (a couple of blocks back from Playa de Onderreta ). All lovely and well worth a visit. One day I may have the bucks to justify trying the 3 star establishments. Donostia has it all. It is a beautiful place, with beautiful food, great wine and lovely people. Mrs. SF also approved of the seemingly huge number of shoe shops it has. What more could you ask of a place? Hmmm maybe a little less rain, but I am being picky. I absolutely love the place and if I ever win big on the lottery this would be first place I would buy a house. I would very quickly be the size of a house if I lived here mind. One of the best and most comprehensive restaurant reviews I’ve read! Lovely blog post, thank you. Since you tried both, which would you recommend, Bodegon Alejandro or Kokotxa? I have a reservation at the latter, but thinking of swapping it. Thank you! I think we’ll stick with Kokotxa as it’s the only ‘formal’ place we’re planning for our visit. But like you, I’m sure we’ll be back! Hope you enjoy (wine list very good value I recall). If you like wine Rekondo has one of the best wine lists in the world and wine prices are incredibly good value. 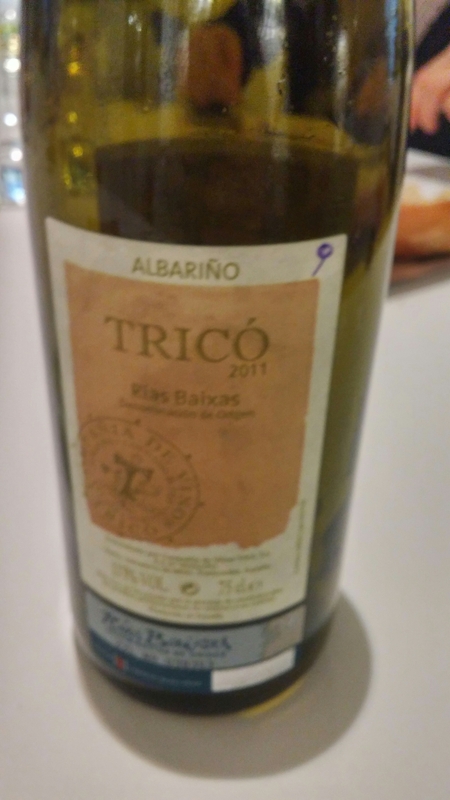 This entry was posted on Nov 16, 2014 by solicitingflavours in albarino, Alcoholic drink, Basque Country, Donostia, Drink, Fine dining, fish, Food, Food and wine products, lunch, Michelin star, Rioja, San Sebastian, Spain, Tasting menu, White wine, wine, wine mark up.